One characteristic common to anomurans is having the fifth pair of walking legs greatly reduced in size. There is a possibility that this diverse group may be in need of higher-level taxonomic revision as the relationship between the major groups of anomurans is not understood. There are over fifty species from this infraorder recorded in BC with most being fairly common and easily observed. There are three superfamilies and eight families of anomurans found in the north Pacific. View a line drawing by Aaron Baldwin here. Mole crabs, in the family Hippidae, are represented by a single species (Emerita analoga) that are normally found only as far north as Oregon. Occasionally (due to larvae transport) colonies will be become established as far north as Kodiak Island, Alaska but these are rare and do not persist. Mole crabs live on high-energy sandy beaches and their presence is usually evidenced by the abundant molted shells in the drift line. The porcelain crabs, family Porcellanidae, resemble true crabs but differ in having a well-developed tail fan (like lobsters and shrimp) that can be used for swimming. Their name comes from the fact that they will readily shed limbs if handled roughly or otherwise stressed. The extremely flattened body of the common genus Petrolisthes allows them to squeeze into tight crevices between rocks. 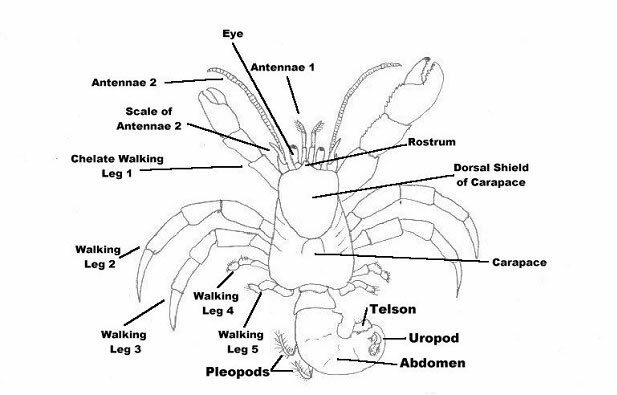 Closely related to the porcelain crabs are the squat lobsters and pinch bugs in the families Galatheidae and Chirostylidae. 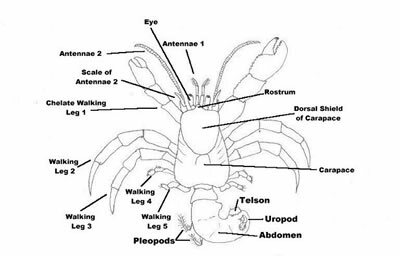 These resemble small lobsters as their abdomen commonly is extended outward and is commonly used for swimming. The only member of this group usually encountered is the squat lobster, Munida quadrispina, which is found in fairly shallow water and is often captured in shrimp pots. There are several other members of this group found in much deeper water where they are commonly associated with deep sea corals and hydrothermal vents. Hermit crabs, members of the families Paguridae, Diogenidae, and Parapaguridae share the common feature of having their soft, uncalcified abdomens elongated and usually hidden inside of an empty snail shell or other hollow object. The king crabs, family Lithodidae (below) are very closely related to hermit crabs. Hermit crabs spend a great deal of their time searching for new homes. They can often be observed 'testing' new snail shells, first reaching inside to insure they are empty, lifting the shell to test weight and portability, then quickly switching shells if the new home is approved. They usually ignore shells with a live snail inside although will often forcibly evict other hermit crabs who have the misfortune of carrying a nicer shell and being smaller than the aggressor. For many hermits the availability of homes limits their distribution. For example, the larger species of hermit crab need to live where the largest snail species also occur. In areas with a high density of hermits it is common to see individuals in shells that are far too small or shells that are severely damaged and offer little protection. Some species, such as the abundant intertidal Pagurus hirsutiusculus, have a reduced abdomen and a more calcified carapace that allows them to live in much smaller shells then would seem appropriate. Other species live in specialized sponges or hydroid colonies that grow with the hermit so that it never needs to switch homes as it gets larger. A few species are specialized to only live in empty worm tubes or tusk shells (Dentalia). 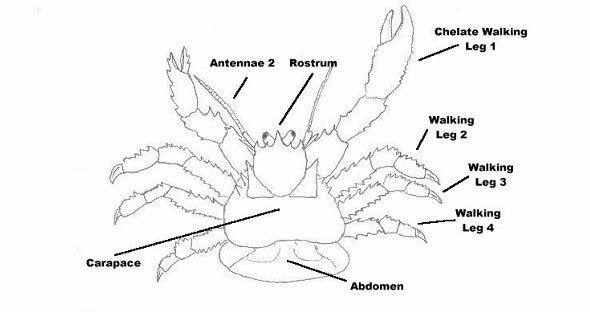 Litholid crab morphological features, illustration by Aaron Baldwin. King or stone crabs, family Lithodidae, are a fascinating group that demonstrates convergent evolution in body shape with the true crabs. They are, in reality, highly modified hermit crabs that have their abdomen greatly reduced and flattened so that it can be carried underneath the body. 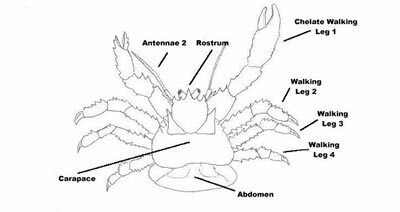 The carapace is typically calcified and the abdomen varies with some species having calcified plates while others retain the soft abdomen of their hermit crab ancestors. Most areas of the world have just a few species of this family while in the north Pacific there are about eighteen which indicates they probably evolved here. Lithodid crabs, like hermit crabs, lack the ability to concentrate calcium from seawater. Because of this they need to ingest large amounts of calcium in order to molt properly. In captivity king crabs can be observed voraciously feeding on echinoderms (sea stars and their relatives) in the weeks before molting. If denied this they usually will die during the molt or soon after. Most king crabs are omnivores and scavengers, but a few species (like Cryptolithodes spp.) feed almost exclusively on algae. © Copyright 2018 E-Fauna BC.